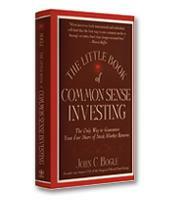 Throughout his legendary career, John C. Bogle – founder of the Vanguard Mutual Fund Group and creator of the first index mutual fund – has helped investors build wealth the right way and led a tireless campaign to restore common sense to the investment world. Along the way, he’s seen how destructive an obsession with financial success can be. Now, with Enough, he puts this dilemma in perspective and considers what “enough” actually means as it relates to money, business and life. When business troubles are getting out of hand, and many of the financial institutions that once supported our economy are crumbling around us, it helps to have a voice of reason among the many wild-eyed speculators and harbingers of doom. Today, one voice that rings loud and true above the tumultuous events that have many people worrying about the future and fretting about the past is that of John C. Bogle. Many people have recently become aware of Bogle because he was one of the few voices of reason that predicted the dire consequences of rampant irrationality in the financial sector early in the game. 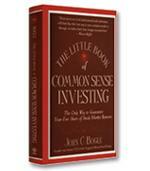 Long ago, Bogle was calling for a change in behavior in the financial industry. Now that many banks have failed and the economy is deep in recession, many people realize that Bogle was right. Today, he is more than the founder of the Vanguard Mutual Fund Group, president of its Bogle Financial Markets Research Center and one of Fortune magazine’s top four “Investment Giants” of the 20th century. He is also a strong leader at a time when strong leaders are needed most. Throughout his latest book, Enough: True Measures of Money, Business, and Life, Bogle calls for accountability where very little has recently been found. He asks for commitment and stewardship when these concepts have fallen out of style among many business leaders. He also reminds executives to embrace the values of the past that were once the foundation of the United States’ founding fathers that helped them build a strong and vibrant country. Enough does more than simply point out the rampant greed that threatens to destroy the financial system and corporate environment that is vital to the world’s prosperity. It reintroduces the concept of “enough” to everyone who might have forgotten its importance while struggling for more and more of what they believe will bring them the fleeting “success” they chase. He explains that a lack of understanding about “what enough is subverts our professional values” and undermines “a system that should be built on trust” rather than a foundation of slick calculations and deceptive practices. Finding enough to Bogle is moving away from the “worship of wealth and the growing corruption of our professional ethics.” To find this elusive enough, he explores the concepts of money, business and happiness by focusing his insights through the lens of reason. He also polishes his words and wisdom with thoughts from dozens of other brilliant minds, past and present. From Socrates’ beliefs about the value of virtues, truth and the “improvement of the soul,” and Benjamin Franklin’s call for hard work, frugality and temperance, to the more contemporary concerns of Warren Buffett’s partner at Berkshire Hathaway, Charlie Munger, about the antisocial effects of making money, and investment guru David Swensen’s belief in passive index funds managed by not-for-profit organizations, Bogle captures a broad wealth of adaptable knowledge. Underneath the balance and truth Bogle hopes to instill into the world of finance and business, he also explores the foundations of happiness that can help executives reach that balance and truth before they break the bank. He reminds us that happiness stems merely from autonomy, staying connected to other people and exercising competence with our talents. Along the way, he points out that money is not on this list due to its transitory nature. 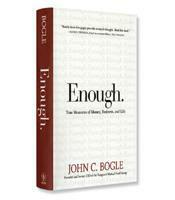 By describing himself as a successful person who has discovered the secrets of enough by recognizing what is truly important to him, such as supporting family, giving back to the less fortunate and serving society, Bogle provides a healthy example of how others can find happiness in their own lives. While Enough turns one man’s amazing story of financial and personal success into a guidebook to a more satisfying life, it offers more than a memoir about a life well-lived. Enough also presents a clear understanding of the fields of finance, money management and leadership that is tempered by wit and wisdom from across the ages that puts it all into perspective while leading the way forward for anyone willing to take Bogle’s enlightened idealism to heart.